The Author as Cricketer: Another Shot from the Vault! | AUTHOR. ACTOR. SWORDSMAN. 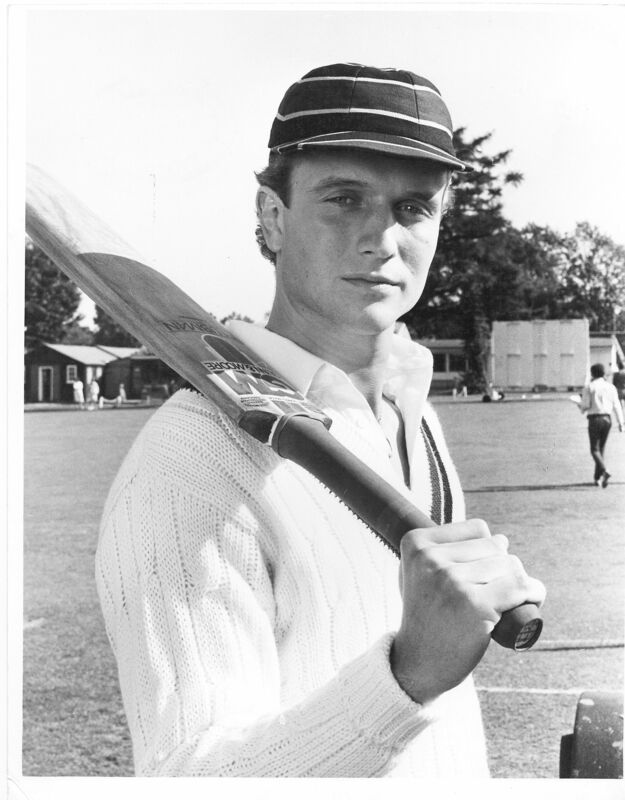 The Author as Cricketer: Another Shot from the Vault! I don’t really recognize myself here. I look more full of face than I was wont. Too long with Craft Services always available? Too many pints after wrapping? Or it may be in the eyes. A touch of terror? An actor awaits the call to bat for England. The show was ‘OUTSIDE EDGE’. A theatre play about a beloved British institution – the local cricket team – transposed to the screen as a teleplay. It was unusual – the first time a UK TV company – London Weekend – decided to ‘film’ the entire drama on ‘lightweight’ video cameras, only used hitherto for sport. I was Alex Sagar – the best player on the team and supremely arrogant. The look of terror? I was batting out of my league. I’d done a couple of TV’s before this and thought I knew a bit. But this was a step up. The cast included the marvellous Paul Eddington (Yes, Prime Minister) Prunela Scales (Sybil Fawlty), Michael Pennington (an actor I’d much admired at the Royal Shakespeare Co.) Various other luminaries. I remember the director, Kevin Billington, having to fetch me out of the toilet at the readthrough. And the nature of the shoot was new to me. All on location at Woodmansterne Cricket Club – an hour’s drive from my North London base. Once there, I was mainly on ‘weather cover’ – at the beck and call of AD’s and rain gods as to whether I filmed or not. Mostly, as the youngest member of the cast, they filmed the illustrious then rushed me out late on the day for a few takes. Hence a lot of hovering – and hoovering! – at Craft Servces. Hence the consoling pints end of day. I spent most of my time in a trailer losing money at backgammon to Leslie Ash (Quadrophenia, much else later). I learned a lot though. Example: don’t eat a Mars Bar at the top of a take. You’ll have to continue eating one throughout each subsequent take and on the 9th, trust me, even a Mars bar tastes ghastly. I discovered that most useful screen actors prop – the spit bucket, just out of frame. But the actors, especially Paul Eddington, were wonderful to study for their comic excellence. Five weeks it took. We actually rehearsed for a few days – unheard of now, of course. And I sought out friends still playing cricket – I’d traded bat for sword at school when I was 13 – for some great sessions in the net. The wrap party was an epic of debauchery which ended with Leslie driving me in her Range Rover at 1 am to a seedy club on the King’s Road in search of the actor Michael Elphick (Withnail’s poacher, amongst many others) who was a pied piper of sin and led us on a merry dance to a dawn finish. The hangover was immense. I don’t think the part was my finest hour as an actor. I’ve never been very good at the ‘straight role’ – I’ve been fortunate enough over the years to play a lot of character roles, my much preferred pursuit. The following year I was to get my big leading break… as a Jewish Gladiator. But that is for another day- and another photo. This entry was posted in Uncategorized and tagged acting, acting tips, author, books, historical fiction, novels, theatre, Writing. Bookmark the permalink.